August | 2011 | Sweet Cats! 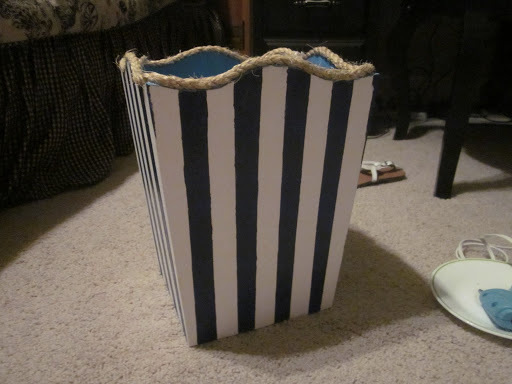 1) Paint your trashcan in whatever color or pattern you’d like. 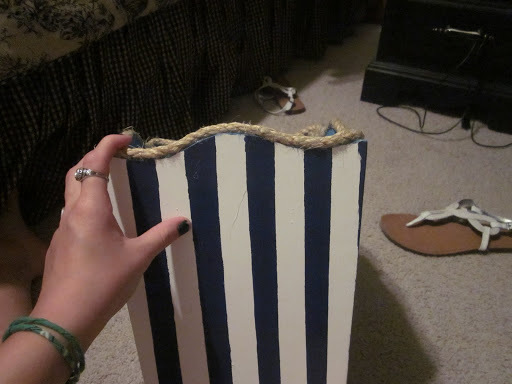 For my stripes, I painted the entire trashcan white (I’d recommend using multiple coats). Then, I placed masking tape in straight lines, leaving stripes in between the tape that were the width of the tape. 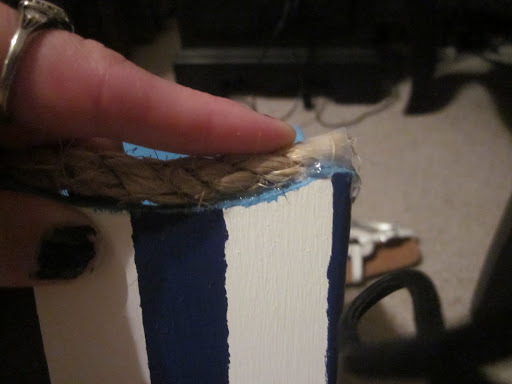 Make sure you press down the edges of the tape so the paint doesn’t seep through. Paint the spaces in between the tape and remove the tape when it’s dry! 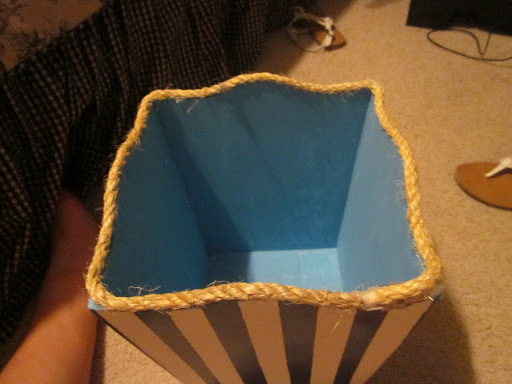 I also recommend painting the inside and bottom of the trashcan for a more polished look. 2) Next, cut your rope to a length that will go all the way around the top of the trashcan, giving yourself no more than an inch extra. 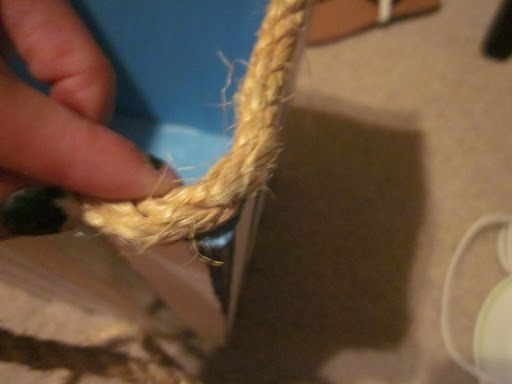 3) Tape the ends of the rope so it doesn’t fray. 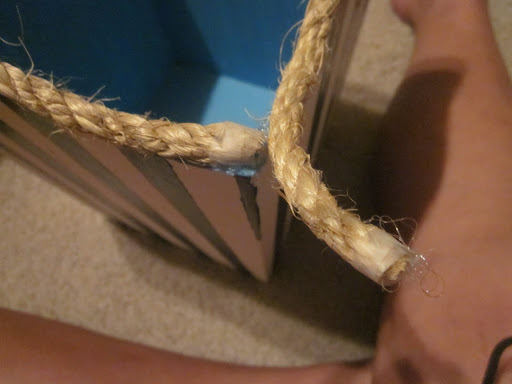 4) Glue one end of the rope to a corner of the trashcan, making sure it lines up directly. You should use a thin line of glue and will probably have to hold it down a while for it to stay. 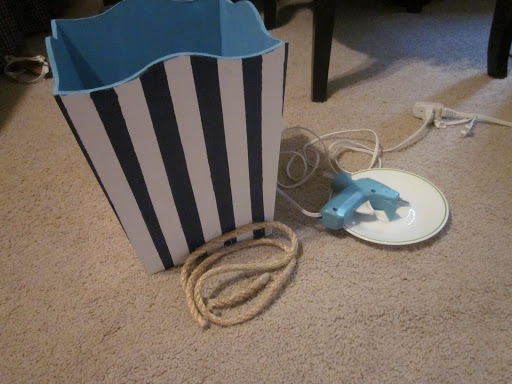 5) Continue gluing the rope onto the trashcan in small sections. 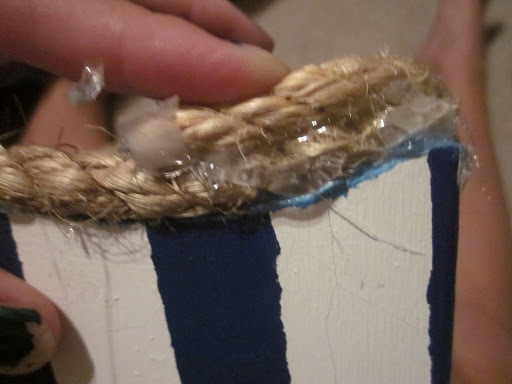 7) Continue gluing the rope until you reach your starting point. You might have a little rope left over, but don’t cut it off! 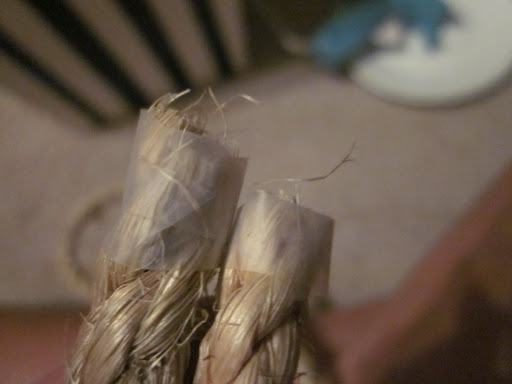 8) Take the extra rope and glue it on top of the other rope, as if you were going to wrap it around again. This time will require LOTS of glue, and you’ll probably need to hold it down for a few minutes to make sure it sticks. And you’re done! Here’s what it looks like! I’m super excited about this, and I can’t wait to see it in my dorm room in 6 DAYS!!! OMG. That being said, since I’m going to college and might have actual social events to attend, I’m not really sure how often I’ll be crafting. I won’t give it up of course, but it might not be such a giant part of my vida anymore. 😦 BUT I’m taking all my stuff with me! I have a tub to put it in and everything! So, until next time, whenever that may be! This DIY might just be my favorite so far! I love headbands, and I’ve been wanting some wide ones for quite some time, so this was the perfect project! I used a leftover piece of thin, woven fabric for one, and the bottom band of a sweatshirt for the other. I can’t take much credit for the idea for the sweatshirt headband, because I got the idea from the blog Studs and Pearls (http://www.studs-and-pearls.com/2011/02/diy-leftovers-sweashirt-necklace.html). Yes, I did make the sweatshirt blazer, but no, I will not show you, as it turned out looking like something the bag lady would wear (it was my first DIY). As for the woven fabric, I really like the tribal trend, and I thought it would make a great fat headband! I haven’t worn either one of them yet, but I forsee them becoming my new bff’s once school starts! 1) First, we’ll make the tribal headband. Trim the fabric so it is about an inch short of fitting around your head. also trimming any frayed edges off. 2) Fold one end of the fabric over about 1/4th of an inch. Using a zig-zag stitch, sew down the center of the fold. 3) Fold the fabric over again, this time making it a little thicker. Using the zig-zag stitch, sew down the middle, going back and forth a few times. 4) Repeat steps 2 and 3 on the other end of the fabric, making sure the folds are on the same side of the fabric. 5) Wrap the fabric around your head again, measuring the gap between the two ends. Cut the elastic to the length of the gap. 6) Using the zig-zag stitch again, sew the elastic onto the fabric, making sure it is centered. I would suggest going back and forth a few times to make sure it’s secure. 7) Repeat step 6 to sew the other end of the elastic to the other end of the fabric. Make sure it isn’t twisted before you sew! Now for the black one! 1) Wrap the fabric around your head to measure. This time, it should fit all the way around your head and overlap a little. 2) Using the zig-zag stitch on your sewing maching, sew the ends together, making sure it isn’t twisted. Sew it a few times to make sure it’s sturdy. And you’re done! I contemplated adding buttons, but I decided plain black would be more versatile…and also, I didn’t really feel like sewing them on. 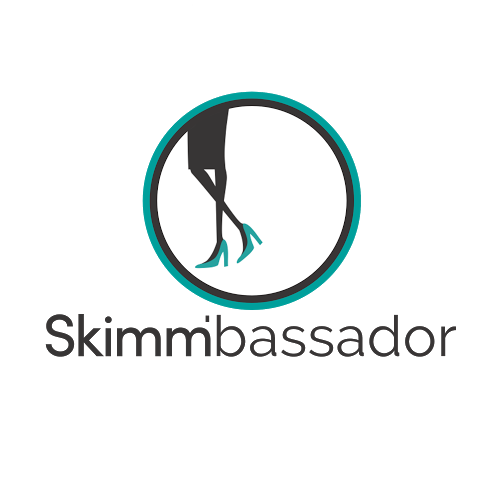 But if you want to add buttons, or rhinestones or anything, go for it! Here’s what it looks like! See how easy that was? I plan to do this a few more times, and I want to experiment with different materials. These are very versatile and can be added to basically any outfit. Well, any casual outfit that matches. I’m not really one for an eclectic mix of clothing. I like my solid J-Crew tees and shorts. Which these might look cute with, actually… Anyways, I have no idea what my next DIY project will be, so it might be a while. Let’s hope I figure it out soon! Until next time!